After having met thousands of sanctuary residents from coast to coast, I've come to realize that certain individuals will instigate relationships that stick with me, despite perhaps only meeting them for a brief visit. Rather than think of this as favoritism on my part or theirs, I have come to think of it as no different than the humans with whom I have varying levels of relationship. Certain individuals feel like they have been part of my world for ages. Jake goat was one such who demanded a level of intimacy from our very first meeting. He struck me as the kind of grandfather some experience: the one whose adventures continue unabated into elder life, unmitigated by concerns about leaving gates unopened or potential treats undiscovered. He was bold in character and in body, with his massive horns and toothy smile. My two visits to New Moon included following and being followed around by Jake, enjoying his company and his elder goat wisdom and moxie. 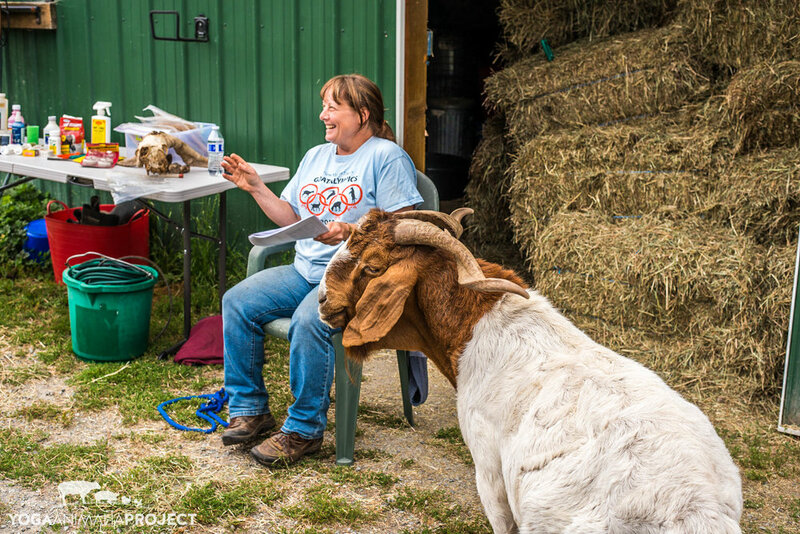 Jake assisting in the demolition of sanctuary property, aka the best goat scratching area, or rather, anywhere convenient when an itch occurs. The actual goat scratching device. Apparently good too. When I first arrived at New Moon, it was Jake who greeted me, despite being in an area where goats were not supposed to be. A gate was no obstacle for him however, as he figured out how to open them. 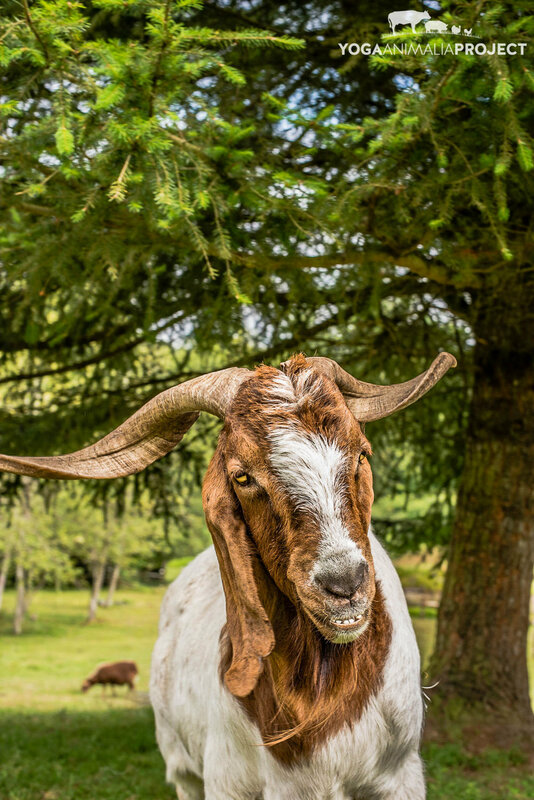 He assumed the critical responsibility of being the greeter goat, and this extended to ensuring my time at the sanctuary was full of goat scratches. Jake was also frequently instrumental in the goat care classes that Ellen leads, and he helped educate so many humans as to the appropriate number of treats to be offered (all of them, obviously), in addition to the details about proper caprine care such as hoof trimming and anatomy and toxic plants. Dandelion treats since the humans seem to have run out of decent offerings. When I saw New Moon post about Jake's death, it struck me intensely. Though there was deep sorrow in learning this, he had a long, amazing life, and knowing him fills me with joy, as I know it does the many people with whom he was connected. I am honored to share these images and stories about his life. What also struck me were the beautiful tributes that poured in to the New Moon Facebook post about his death, testament that Jake touched many lives, so much so that a wake was held at one of my favorite restaurants in Seattle, No Bones Beach Club. A powerful figure was Jake in the sanctuary world, and one who will be dearly missed. Jake's life and his celebration after death reaffirm for me the importance of sanctuary: holding space for connection. And treats, don't forget lots of treats. The very first image from New Moon I edited, and still my favorite, showcasing his grin and reminding me of traipsing about learning his caprine ways. Your resident spotlight this week focuses on a handsome bovine who resides at Kindred Spirits Sanctuary where I am currently staying. Sometimes I look out my bedroom window and Owen and his herd are casually grazing nearby. My first visit to Kindred was with the intent of photographing Owen specifically for LAIKA magazine. I have had the great privilege to photograph him on many occasions now. Born on a small beef farm, Owen’s mother likely had a disease or deficiency that led to his eyes improperly developing. Blind at birth, the young calf was seen as a waste of time and money, but rather than shoot him as many would, they contacted Kindred Spirits to take him. This unexpected bout of compassion extended to them allowing Owen to stay with his mother for a month before coming to sanctuary, but sadly did not include them surrendering her. 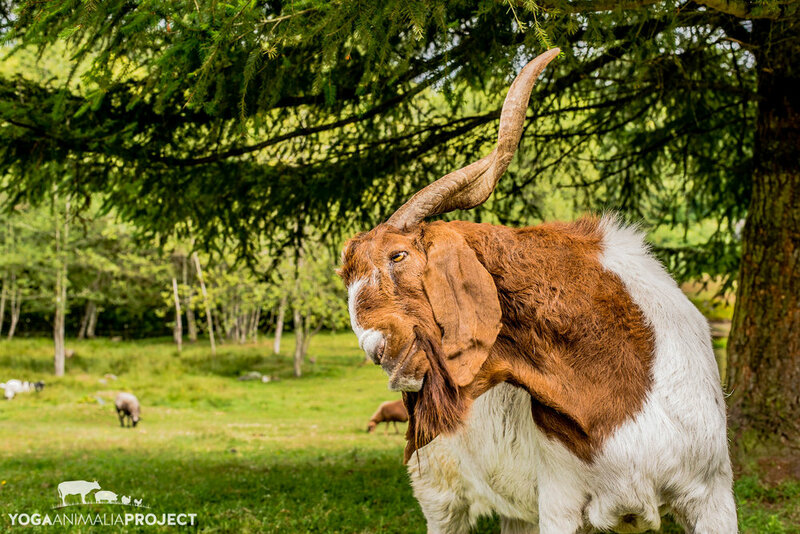 At Kindred Owen has bonded with his small herd, including subsequent generations of calves. He can often be seen gentling and lovingly licking herdmates. Brownie and Owen, with wild egret friends taking advantage of what the steers' hooves unearth. A reality of how I edit photos: it makes very little logical sense. I'll confess it. I have found in the past if I am very regimented and work through them methodically, there is a lack of creative juice that I believe dilutes the potency of the individual's portraits. Or maybe I'm just too finicky and need to get the darn photos edited! So I have been compromising a bit - editing a few from each sanctuary, doing small steps here and there. It very likely is far from the most efficient, but then I come across a photo like this one, demanding immediate full edits. I distinctly remember capturing this image because Jack is a goat who most assuredly does not want humans in his space. Patience and luck were the source of this sunset capture: patience to let Jack be Jack and me not to be a totally obnoxious interloper whilst I watched the sun dip lower and lower, and that hefty dose of luck that let it all work in time to catch the sun through the trees. Sunset and sunrise photos are a particular favorite of mine, and given the opportunity, I love staying at a sanctuary to attempt to capture them. I find it highly amusing that Jack is one of the Skylands residents with whom I managed this feat. I'm keeping my fingers crossed that another one I might have gotten of Grover sheep will be equally as magical. It is hopefully somewhere among the 3400 photos of Skylands residents! It is one month into my Winter 2018 at Kindred Spirits Sanctuary in Ocala, Florida. 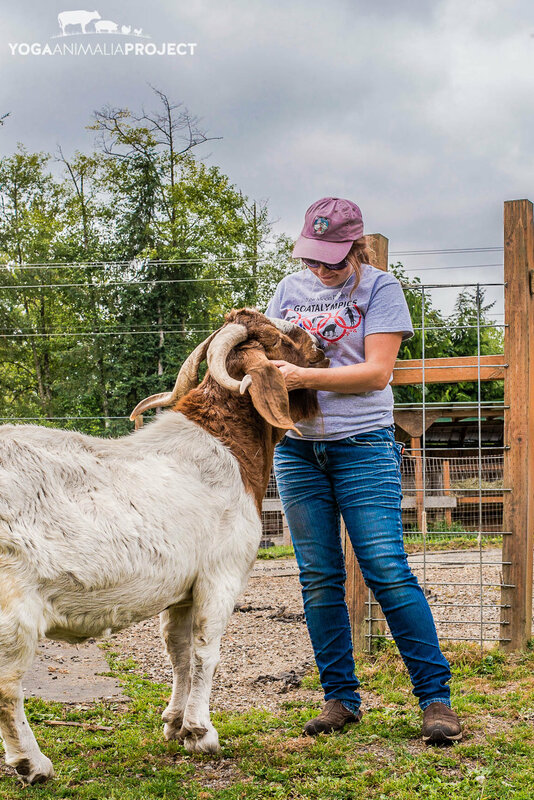 I have been editing, writing, backing up photos, getting to know the Kindred residents a little better, and working with (and learning from) Kindred's on-staff vet, Dr. Dow, including veterinary trips to Full Circle Farm Sanctuary and Rooterville. More new images captured from those visits, and lots of new Kindred photos to come. My current favorite newly edited photo is of young Luna cow from Kindred included below. Recently I was thinking about my need to write more: to record more of my travels and experiences at the sanctuaries in addition to sharing the resident's stories. It got me thinking about how intensely grateful I am to be part of the sanctuary world, so much so that the term "sanctuary groupie" popped into my head (and I may have been listening to Lana Del Rey's "Groupie Love" at the time :-). Hence the new name for my blog and missives from my travels. I intend to be much more diligent about newsletters and blog posts in 2018, because after two and a half years of travel, the stories are starting to get jumbled in my wee brain! I am also committed to sharing sneak peaks and exclusives with my Patreon crew, because their monthly patronage has enabled me to start selecting and editing the massive backlog of sanctuary images - 40,000+ to peruse I estimate, from 74 sanctuaries. 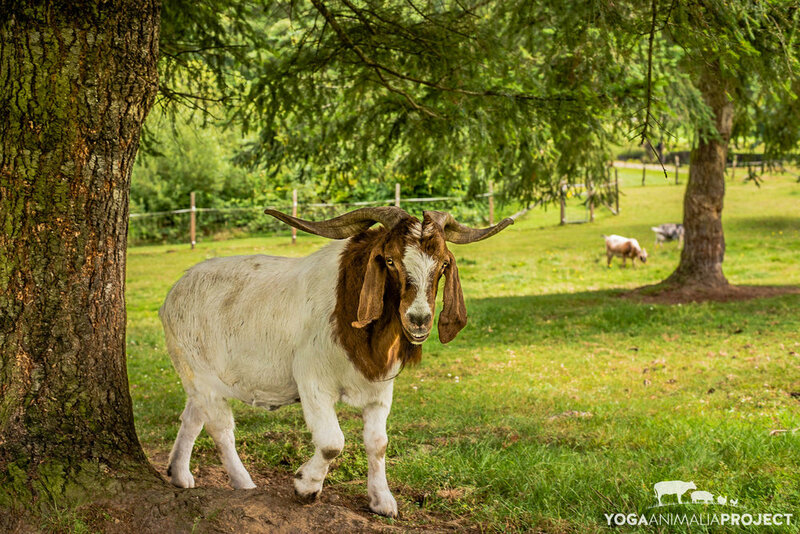 You can become a patron for as little as a $1 a month and contribute to the expansion of the Yoga Animalia Project. Happy Holidays! I recently visited United Poultry Concerns in Machipongo, Virginia on my way south, and I was absolutely delighted to finally spend some time with Karen Davis and the sanctuary residents. The human and avian team at UPC have been creating change for birds for decades, and I am so honored to have visited and photographed at the sanctuary which is a haven for formerly farmed animals amidst one of the most concentrated chicken factory farming regions. I just arrived in Ocala, Florida at Kindred Spirits Sanctuary who are graciously hosting me as I spend winter editing photos from two-and-a-half years of travel. My goal is to dedicate the entirety of winter to preparing the photos and stories from the 74 sanctuaries I have visited, with the hoped-for goal of getting ready to run a crowdfunding campaign in 2018 to make the Yoga Animalia Book a reality. More details about the book to come! In the meantime, if you would like to support my art please consider becoming a monthly patron on my Patreon page. Asking for help as an artist is really challenging, but I am attempting to get out of my own way and make it easier to bring my sanctuary portraits into the world. Your support will enable this, and through Patreon, you will get neat bonuses not available anywhere else. Many thanks for reading, and I hope your holiday season is surrounded by that which makes you happy. I will leave you with a few snow photos of my friends at Indraloka Animal Sanctuary.